A brilliant, edgy thriller about four strangers, a blizzard, a kidnapped child, and a determined young woman desperate to unmask and outwit a vicious psychopath. A kidnapped little girl locked in a stranger's van. No help for miles. What would you do? On her way to Utah to see her dying mother, college student Darby Thorne gets caught in a fierce blizzard in the mountains of Colorado. With the roads impassable, she's forced to wait out the storm at a remote highway rest stop. Inside are some vending machines, a coffee maker, and four complete strangers. Desperate to find a signal to call home, Darby goes back out into the storm . . . and makes a horrifying discovery. In the back of the van parked next to her car, a little girl is locked in an animal crate. Who is the child? Why has she been taken? And how can Darby save her? There is no cell phone reception, no telephone, and no way out. One of her fellow travelers is a kidnapper. But which one? Trapped in an increasingly dangerous situation, with a child's life and her own on the line, Darby must find a way to break the girl out of the van and escape. But who can she trust? With exquisitely controlled pacing, Taylor Adams diabolically ratchets up the tension with every page. 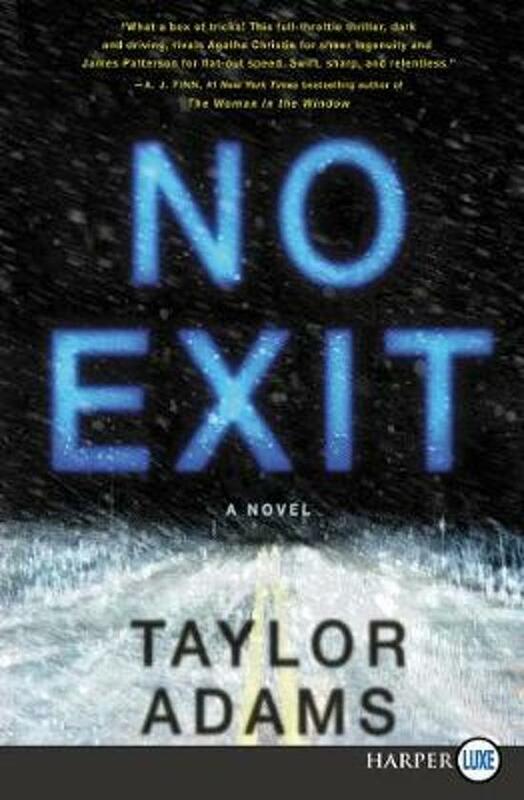 Full of terrifying twists and hairpin turns, No Exit will have you on the edge of your seat and leave you breathless.